I was something of a fitness fanatic in my early 20s and used to work part time at a local gym as an instructor. I took some time out to start a family and after having my two girls, I struggled to find the time and motivation to get back into shape. It should have been easy for me given my personal experience, but as a middle aged mother, I found my drivers and priorities were quite different to those of the 20 year old me! When I fully came to terms with that, I changed my approach to getting into shape and everything seemed to fall into place. These days, I still work out, but my coaching is limited to using my writing help and advise to people who want to improve their muscle tone. Critically, that includes finding a way to go about it that matches their starting point and personal circumstances. When you’re fit, losing your fitness sounds like the last thing you’d want to do. Worse, when you’re overweight and find your fitness, the prospect of an injury causing relapse becomes an unacceptable option. You’re not the only one with this fear. On a national level there is annual estimate of 8.6 million sports and recreation-related injuries that result in doctors visits a year. Of the reported injuries, 42% were in the lower extremities, 30.3% in the upper extremities, and all of them equally as annoying and discouraging. Whether athletics play an important part in your daily life or not, experiencing an injury is frustrating. This is OK for a little while as long as I can get back to my activity ASAP. With the notion of getting back to our exercise or life activities on the horizon, it’s important to continue to engage in certain movements to ensure that you don’t experience muscle atrophy. Injuries can lead to loss of muscle mass and strength, but they doesn’t have to. The following four tips will help minimize muscle loss after a physical injury and help you resume your activities as quickly as possible. The entirety of this post is for people who are nervous about deconditioning, or overall muscle atrophy. It’s important to separate this from local muscle atrophy caused by an injury. Attempting to exercise and strengthen local atrophy will result in more stress to the damaged body part (usually a joint that is permanently damaged) AND faster wear-and-tear to that joint. Below is a patient of ours who had local muscle atrophy, who would do his body more harm than good if he followed the recommendations in this article. Make sure you don’t have local atrophy before continuing. After about two weeks of allowing your body to rest from most minor injuries, you should be able to ease back into exercise, and swimming is one of the best ways to get active. Swimming is a way to engage in light resistance training while also supporting your body, helping to alleviate strain from impact. DR. CHRIS’S COMMENTS: Swimming is generally safe for a recovering athlete while I’m treating them to fix their pain. It puts minimal stress on almost all joints and muscles. Still, especially with our patient population who has had pain more than 6 months even though they’ve seen 3-5 other doctors, I insist on knowing all activities that person might do. Check in with your doctor before engaging in any physical activity following a major injury or surgery. excellent nutrition such as animal protein, bone broth, and colorful vegetables. These will be crucial in beginning the path to total recovery. As a general rule, you should be able to work on other muscle groups that aren’t affected by your injury. Working around your injury or muscle tear is doable, and it offers you an opportunity to enhance other muscle groups that you might not normally focus on. If you’ve got a quad injury, you can work out on upper body machines until your quad muscle heals to prevent muscle atrophy from kicking in. If you have an upper body injury, such as your shoulder or elbow, why not concentrate on lower body exercises? Strengthening your weaker body parts can even help you alleviate pain experience in other areas of your body. 5 Push-ups without symptoms and with ease and control. Level 1: 15 Hip lifts with ease. Level 2: 5 lunges per leg without symptoms and with ease and control. 15 Good Mornings with a 15 pound training bar or body bar across the back. If you’re going to use these tests or some other exercise, get your phone out and record your set. Write down your sets, reps, any symptoms you felt, and grade your difficulty: mild, moderate, extremely. Do your strength routine and reassess in 2, 4, or 6 weeks. This is a good practice to develop mindfulness of the body which will pay dividends when it comes to living a pain-free life 30 years into the future. Core exercises are a great way to focus on building muscle while alleviating back or spinal pain, and any type of upper body lifting can allow you to improve things such as your shoulder mobility while allowing a lower body muscle injury to heal. Muscle atrophy is the result of reduced protein metabolism. The proteins break down faster in your body with disuse. The pain you feel is not only associated with the muscle that is injured, but with reduced blood circulation. Heat can address all of these causes and stimulate the repair process for you all while improving the quality of your skin. In addition to proper icing and using the pool for physical activity, studies have found that spending time in a sauna can help fight atrophy. Exposing your muscles to intense heat releases something known as “heat shock proteins” which can reduce atrophy by up to 20% with just a 30-minute session. DR. CHRIS’S COMMENTS: I strongly dislike heat packs and ultrasound, but I love saunas. There’s no better practice for your overall health and to sit in the heart. There are studies that show they reduce the risk of dementia, improve heart health and exercise endurance, without any cardiovascular fitness! A study released by the International Journal for Sports Medicine asserted that certain supplements can help protect your muscles from atrophy during recovery. Vitamin E is known to be especially effective with the ability to cut atrophy in half. In addition to supplements, you can eat more foods that contain Vitamin E, such as avocado, sunflower seeds, and peanuts. Vitamin A can help your body supports early inflammation during injury and reverse post-injury immune suppression. Copper works to assist in the formation of red blood cells and work alongside Vitamin C to form elastin which will strengthen connective tissue while the muscle begins to repair. Adding more protein-rich foods to your diet can also help your muscles recover quickly while allowing the other, non-affected ones to continue to receive adequate nourishment during your workout routines. Take it slow in your recovery and don’t push yourself past your limits or the limits set by your physician. Within the first few weeks, allow time for your body to rest. Little by little, begin to incorporate exercises back into your routine that allow the injured body part to rest while working other areas. Adding heat and supplements to your recovery journey can help. If you experience any additional pain or discomfort then speak to your doctor immediately. 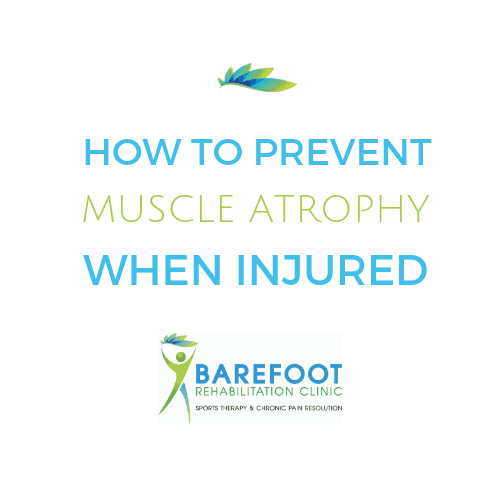 I’m curious, what did you do to prevent muscle atrophy the last time you were injured? Feel free to share in the comments below.